FANTOXIC DEAL! KitSplit is offering family and friends an exclusive 10% discount on all our already low camera and production gear rental rates. The discount extends the entire month of May. That includes you TROMAVILLE! 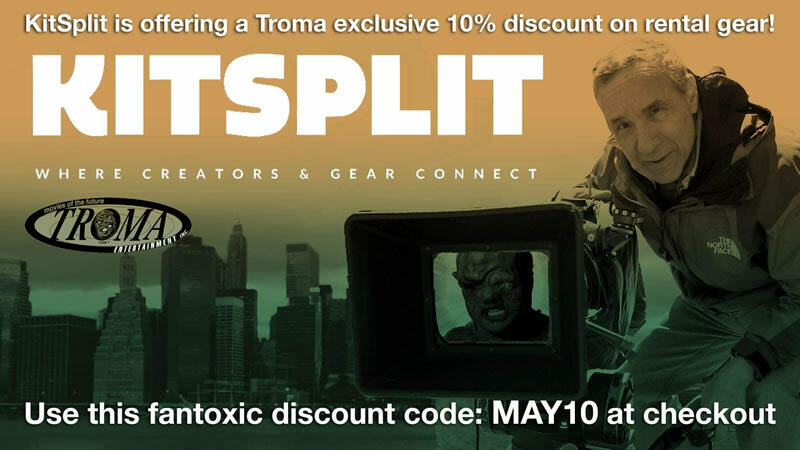 Use exclusive discount code MAY10 at checkout to get 10% off any KitSplit rental. To get the best deals via our free Concierge Service, send your gear list, shoot dates, and location to contact@kitsplit.com. KitSplit is a gear rental platform and community of 30,000+ filmmakers, production companies, and rental houses. Our service makes camera gear rentals and insurance easy and affordable. KitSplit Concierge Gear Experts are on call 7 days a week to advise, find everything you need, and arrange your gear rentals. This entry was posted on Sunday, May 13th, 2018 at 7:27 pm	and is filed under News. You can follow any responses to this entry through the RSS 2.0 feed. You can leave a response, or trackback from your own site. You are here : Home » news » 2018 » 05 » 13 » FANTOXIC KITSPLIT DEAL! – TROMAVILLE EXCLUSIVE!! !